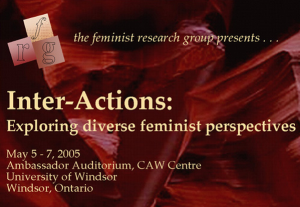 I’ve been a member of the University of Windsor Feminist Research Group (FRG) since 2005. 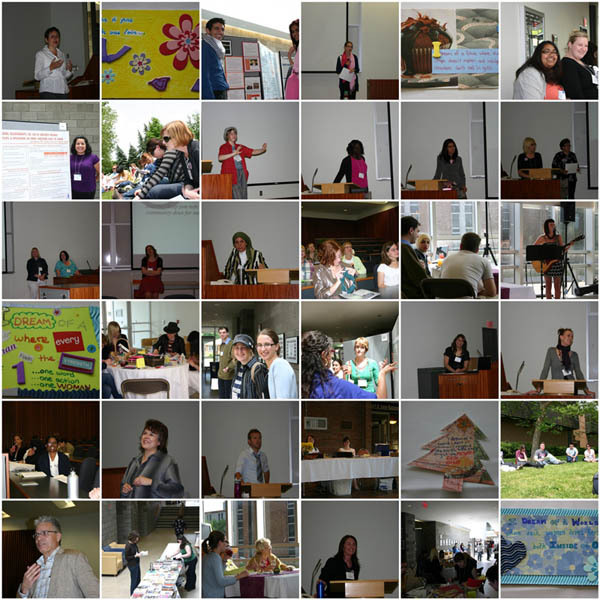 The group’s founding focus was an annual conference, organized by and for graduate students. The first year I submitted my submission was…slightly unusual…so I was invited to present “Ladies’ Tea: the Board Game” even though I was still an undergraduate student. After attending that year, I got involved with the organizing committee, helping on the technical side with websites and program design, as well as with outreach, promotion, and organizing the social events for the conference after-hours. I also continued to present papers each year. After 10 years of annual conferences, FRG has shifted towards other forms of feminist research. Even though I’ve finished grad school and I’m not currently teaching, I’ve stayed involved with the group for the connections and support that a group like this provides. For International Women’s Day 2012, I coordinated an FRG photobooth in the student centre to photograph students and submit them to the Feminist Photo Blog Project, challenging the “This is What A Feminist Looks Like” stereotype and in April 2012, I coordinated a face-to-face plus video book club with author Margaret Dilloway for FRG members to discuss her book, How to Be an American Housewife. To video conference with the author, we used Google’s new (at the time) video Hangouts tool. I continue to provide technical support to the group, mostly helping to manage the listserv as needed.